Good morning, the recent rally in the value of the Australian Dollar versus its American counterpart has been both swift and strong, catching many out including moi. The move has been partly due to US Dollar weakness particularly following Madame Yellen’s softer tone on monetary policy at her Congressional testimony last week. However I believe that the strength of the move is most likely due to rising bond yields following the airing of thoughts on monetary policy by Messrs Carney and Draghi a fortnight ago. The rate rise by the Bank of Canada simply added fuel to the fire which is not even alight yet. The market leader for as long as there have been markets are bonds. It is the bond market which (mostly) values credit risk, time risk, interest rate risk and inflation better than any other market; hence why we need to pay attention to what they are telling us. So on to just that, what is the bond market telling us? 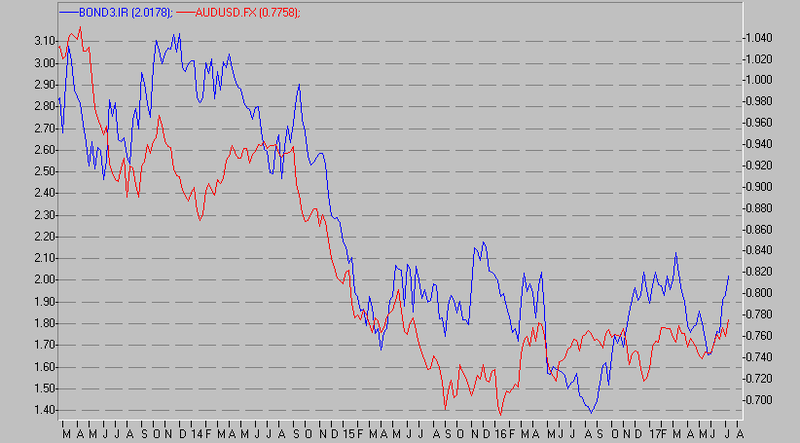 Consider the price chart below and note the loose correlation between the 3 year government bond yield and the Australian Dollar versus US dollar exchange rate. It would be fair to observe that as the bond yield rises so too does the value of the Australian Dollar, so much for it being a “commodity currency”. The trick with this is picking when the yield on the bond has reached too high a level given the underlying conditions which will bring buyers back to the market and so turn the yield lower…….the currency following soon after. Given the Reserve Bank is unlikely to raise interest rates anytime soon and given our economy is not exactly firing on all cylinders I would expect the buyers of bonds to start testing the water pretty soon; the Aussie will follow it back down. On another note, and this is where those far more clever than me can really add value, I attended an economic presentation last week where the presenter opined that the Australian dollar should be trading at USD0.7000 for a variety of reasons, mine not included. So there we have it – a market!